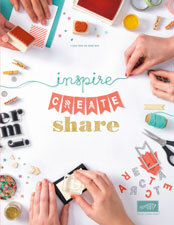 ← Get your free products with Sale-a-bration – it starts today! I had such a productive time at Stamp Club last night that I’ve decided to do a little series of blog posts for the cards that I made during free craft time while I was there. When I go to a crop along night like this, I like to pick a theme – usually centred around a DSP and then I only have to take those colours in Ribbon, Ink, Card, Brads etc. I just find it easier to focus and of course you need to take less stuff! I started by embossing a sheet of Very Vanilla CS with Iridescent Ice Embossing Powder and the stem flower from Friends Never Fade. Then I glued said piece of CS to some chipboard (packing from something I’ve bought along the line) and ran it through the Big Shot with my Beautiful Butterflies Die. 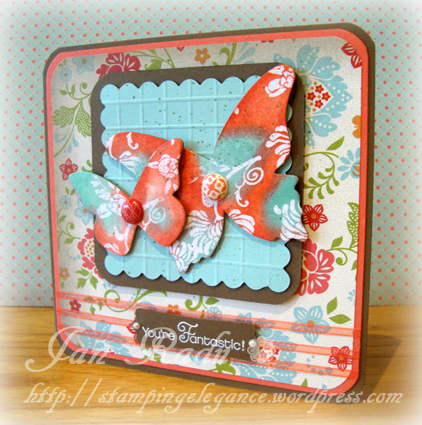 This card is all about the layers – so I layered up with Soft Suede as my card base, then Calypso Coral, then a scrumptious sheet from the SAB Everyday Enchantment DSP pack. All have rounded 1/2 inch corners. 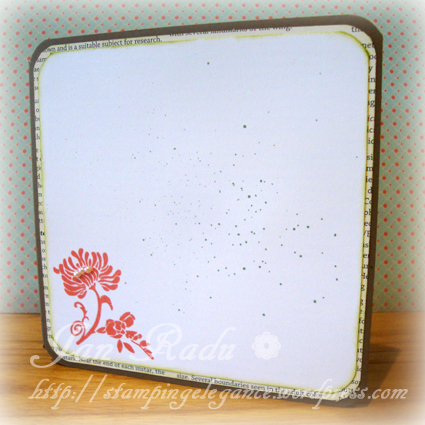 As does the square in the centre, and then the scalloped Pool Party square is made with the Scallop Square Duo Die. I’ve layered three strips of the SAB Calypso Coral Ribbon and added a Modern Label punchy on top with “You’re Fantastic” embossed in White from the Perfect Words Hostess Stamp Set. This punched piece is finished off with a small pearl on each end. I’ve then colour spritzed just a tinsy bit with my Wild Wasabi Marker and Colour Spritzer Tool. 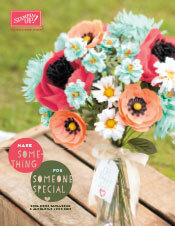 I’ve added some Newsprint DSP to the mix here – it just goes with everything! My friends were chatting last night about how much paper they have accumulated… Once you start layering up your cards like this, you soon start to use some of your stash and end up with a really luxurious feeling card too. Hope you enjoyed your visit today – I will post the next card in this series next Saturday so stop by again then!